Tired of engine rock causing your MINI to be unstable, torque steer and miss shifts. Get that rock under control! The R55 R56 R57 R58 R59 MINI Cooper and MINI Cooper S has a very soft lower motor mount. As a compromise between performance and Comfort, the OEM torque arm mount is set in rubber to reduce vibration and harmonics, however it is too pliable and sloppy for the performance minded motoring. 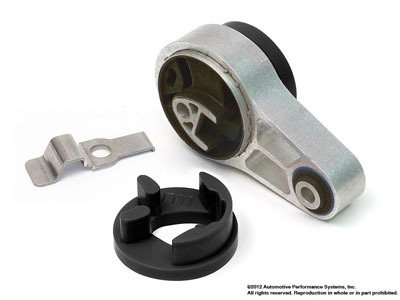 NM Engine Torque Arm Mount Insert is made of polyurethane and reduces engine movement allowing for quicker and more direct transfer of power from the engine to the wheels. Includes 1 set of 2 bushings. Enough for one engine mount. NOTE This round Version is for ALL 08+ MINI's, if you have an 07 verify you have the round lower bushing before ordering, if you have the triangle shaped lower mount use the 07 torque arm insert. Installed on 2009 JCW - ITS A *MUST* piece for all high torque Minis! Had Way install this bushing for me and it was the best mod I've done to my 08 MCS. It was so cheap, but I immediately noticed a difference. The power seemed to transfer better and torque steer seemed to be lessened. I wish I had asked Way about this a long time ago! The whole feel of the car under acceleration, improved dramatically. For $60, it is a must have! My 09 Justa had a problem with throttle response that was getting frustrating. The NM inserts seem to have eliminated most of the "wind-up" feeling and the throttle issue seems to have abated. I really feel that this is the best addition that any Gen2 Mini owner can make to the car, especially for the price. If you are feeling the throttle hesitation in your car, this device will go a long way toward fixing it. Its really that good. Put on a 2010 MINI S Clubman and the throttle response in concert with a Way tune is instant..
Way suggested I buy this, so... I did. What a surprise! Eliminates a lot of the rock and sway of the motor, better input all around and power delivery! Very easy to install. Jack up car, Loosen one 16mm bolt, unscrew anther 16mm bolt, insert bushings over the existing and tighten up. That's it! Recommended to do on your next oil change while you are down there. Installed on my 2011 MCS - Noticed a difference immediately. Install process was extremely simple. This really should be a stock part on all Minis, that or Mini should redesign the torque arm bushing. Had this installed on my 2010 Cooper S today. All I can say is WOW!!! The torque steer and front end squirm is gone and along with NM's short shift kit, the shifting action is shorter and feels more solid. Very easy install. I drove the car up on ramps and loosened the front bolt (do not remove) and removed the rear bolt. Installed the bushings and had a friend push the engine to align the rear bolt hole so I could install the rear bolt. It too me all of 5-10 min. It took more time to put the tools away than to install the bushings. I feel slight engine shake at idle now but the shifting is now a lot smoother. I recommend this product highly. Thanks for the information Way! Installed easily by myself - jacked it up - put jack stands under the jack points - pulled the rear bolt and slipped the inserts in. Slid in to place easily and lined up the bolt. Took under 30 minutes. This scores high on the WAF scale - my wife claimed I used to give her whiplash shifting - but no more - shifts smooth as silk. Noticed a little vibration at first but appears to be gone now. Highly recommended! Had this installed by Way at The Dragon. Slight, not bothersome vibration, but very, very, happy with this mod!! Inexpensive and sooo worth it!!!! Very good upgrade. Thought I'd wait awhile before putting a review out to ensure it was a good deal. Over the past couple of months, it's been great. Noticed the difference immediately and car is much more responsive now. No issues with it squeezing out like some have mentioned. May have to do with how hard you push the car? For the money, it's a no brainer. 2008 S R56 - Car is much more responsive, daily driving friendly, & would purchase/install again.